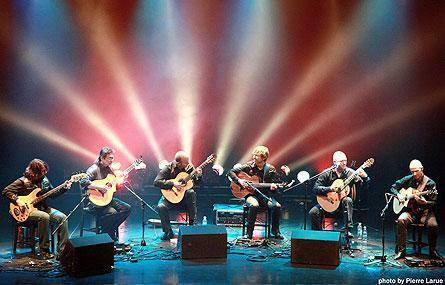 The Montreal Guitar Trio and the California Guitar Trio will perform together at Hope College on Thursday, Nov. 29, at 7:30 p.m. at the Knickerbocker Theatre in downtown Holland. Featuring six virtuoso guitarists from four countries (Japan, Canada, Belgium and the United States), the California Guitar Trio (CGT) and Montreal Guitar Trio (MG3) fuse more than 40 years of combined performing experience into one unique six-by-six-string “phenomensemble.” CGT’s steel stringed-guitars blend naturally with MG3’s nylon-stringed guitars, as each trio’s fret boards chase the other’s original compositions and new arrangements of progressive rock, world, jazz and classical music. For more than 13 years, the Montreal Guitar Trio’s virtuosity, rigor, creativity and dynamic stage presence--they are noted for the wit and warmth of their interactions with audiences--have been winning applause around the world. CBC has described the trio as “the hottest guitar ensemble in Canada,” and the group won the 2011 Opus Prize for concert of the year in the Jazz / World Music category. The trio has given hundreds of concerts in prestigious venues in North America, Europe, New Zealand and Australia, including the BB King Blues Club in New York, the Rundetårnet in Copenhagen and the Concertgebouw in Amsterdam. The members of the California Guitar Trio are not actually natives of the “Golden State”—they come from Belgium, Japan and Utah. The trio, which plays everything from unique originals to cleverly-arranged interpretations of jazz, classical music and even surf rock, has released 14 CDs since its inception in 1991. On screen, CGT can be seen in documentary “Following the Music: On The Road w/ California Guitar Trio” and the Hi-Def multi-camera shoot of an intimate house concert in 2009. In October 2010, the trio released “Andromeda,” an entirely new all-original album nearly three years in the making. It was named Best Instrumental Album that year by the Indie Acoustic Project. The pairing of these two great ensembles was inspired in 2009 by an impromptu studio session together in Montreal. CGT and MG3 have released a live recording (2011), and sustain frequent co-bill touring throughout North America: from the Iridium in New York City, to Montreal Jazz Festival (twice), to Napa Valley Opera House and points in between. The DeVos Fieldhouse is located at 222 Fairbanks Avenue. The Knickerbocker Theatre is located at 86 E. Eighth St.
Dr. Joanne Stewart of the Hope College faculty is part of the leadership team of a national online resource featuring teaching materials for inorganic chemistry that has recently received a major grant from the National Science Foundation (NSF) that will help expand its content. A successful volleyball season is being rewarded with the recognition of three Hope players by the American Volleyball Coaches Association (AVCA). Sophomore outside hitter Jenna Grasmeyer of Hudsonville (Unity Christian HS) has been named a first-team All-American while senior setter Greer Bratschie of Grand Rapids (East Grand Rapids HS) is a third-team All-America honoree. In addition, junior middle hitter Mari Schoolmaster of Portage (Portage Central HS) is an honorable mention All-America.